It was a lot of work, but the end result was worth it. The client is very into Tibetan buddhism and Nepal, and wanted a wedding invitation that evoked the prayerbooks from the area. 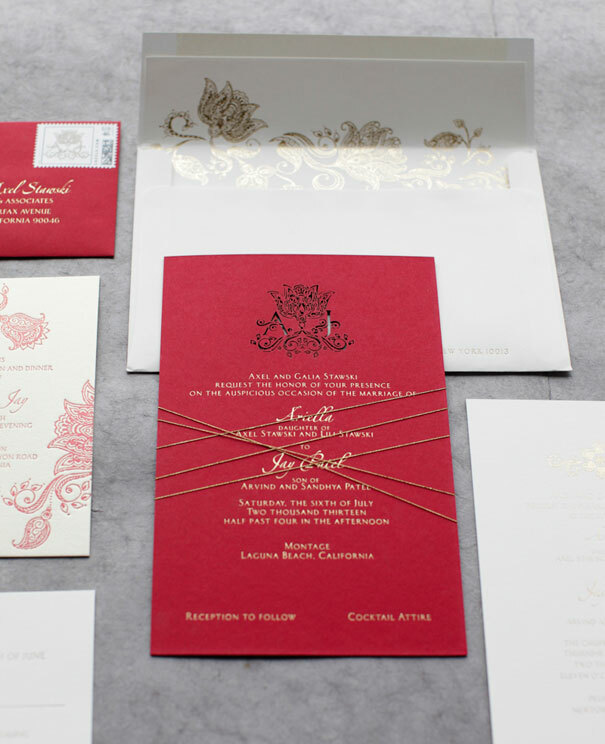 Each of the five cards inside the invitation are two-ply hand-torn Tibetan paper. The bookends are heavy-weight kraft wrapped in dyed Tibetan paper and tied with paper twine. 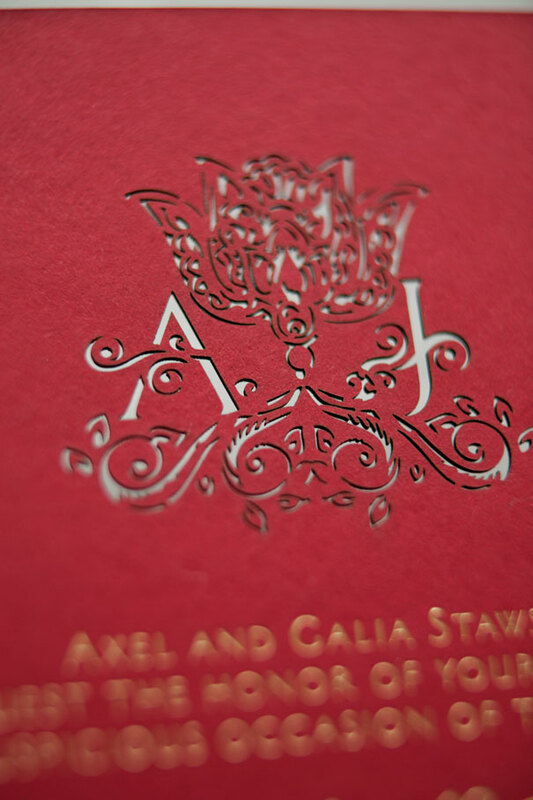 The envelope is custom with white hand calligraphy. This entry was posted in paper, wedding invitations and tagged Lotka, Tibetan paper on November 30, 2014 by Ben Upham. Here at Tiny Pine Press we love Japanese paper! Whenever we it suits the project, we like to include Japanese paper envelope liners or backing. Above is an example of a wonderful combination of Japanese paper (an ocean wave pattern) with a natural wood-backed letterpress wedding invitation. The invitation also features handmade paper and stitching. The invitation was for a beach wedding in California, and the combination of Japanese print and natural wood evokes driftwood and Zen all at the same time. This entry was posted in paper, wedding invitations and tagged Japanese paper on November 25, 2014 by Ben Upham. Yes, just in time for his first birthday (it’s been that kind of year), a blog post featuring our son Otis’ birth announcement. These were quite ambitious, given that we had just had a baby. To be fair, we had no idea Baby Otis would be as much of a handful as he was (is). Still, they came out great. The cards were made from simple recycled chipboard sandwiched between different Japanese papers and edge painted in gold. 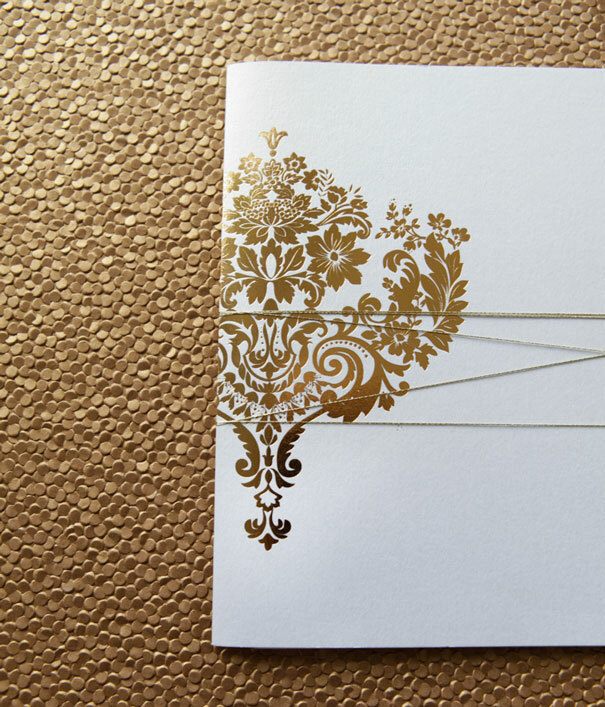 The writing was letterpress on gold card stock, and the whole thing was tied together with ribbon. On the front, a small pressed flower — a Jungle Flame bloom, to be exact. All the gold was sort of in honor of Otis’ name, which apparently means “wealth”, although that’s not why we gave it to him (it’s a grandfather’s). These took an enormous amount of work, but I suppose they were worth it. I will say this, if there’s a #2 he or she will be getting something a bit simpler! This entry was posted in birth announcement, paper and tagged Baby Otis, Japanese paper on October 11, 2014 by Ben Upham. 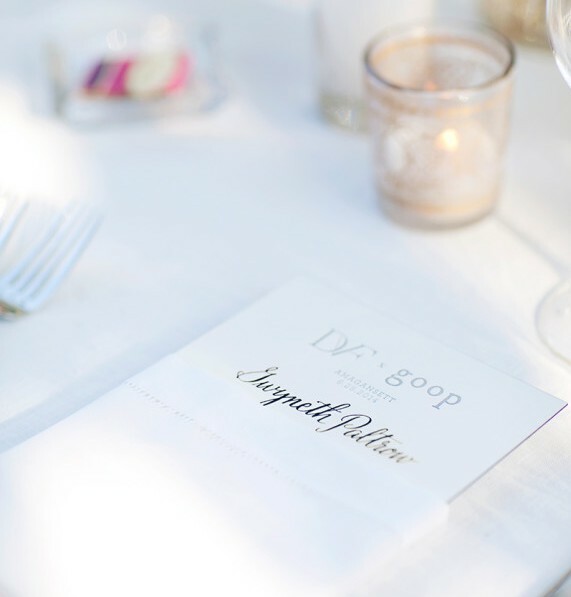 Just a quick post about some menus we did for a party celebrating a successful collaboration between Diane Von Furstenberg and Gwyneth Paltrow’s Goop, as featured in Vogue. 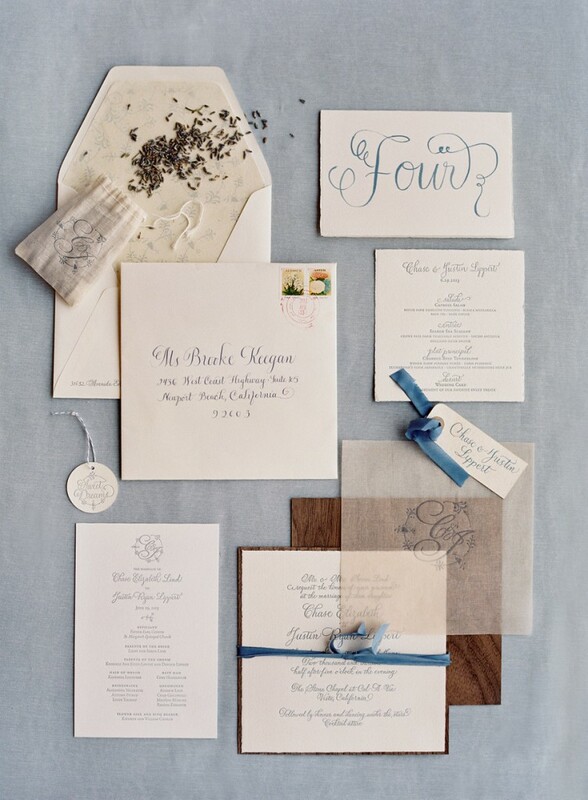 The menus were grey letterpress with black edge painting, and hand calligraphy by Anne Jones. The whole event was put together by Yifat Oren & Associates. This entry was posted in day of paper, events and tagged Diane Von Furstenberg, Gwyneth Paltrow on September 2, 2014 by Ben Upham. Mariska has given us permission to blog about a special invitation we did for her back in November, so here we go (Actually she gave us permission a long time ago, but we’ve taken a looong time to get around to blogging). On November 8, 2013, Mariska Hartigay, star of Law & Order: SVU, received her star on Hollywood’s Walk of Fame, right next to her late mother, Jane Mansfield. Mariska, a long-time client of Tiny Pine Press who we know through our work with the Joyful Heart Foundation, asked us to create an invitation for the after-party. We came up with a design that is, like Mariska, just a little girly and definitely a show-stopper. The design obviously evokes the Walk of Fame stars… Because Mariska loves rhinestones we also made sure to include one of those, too. Plus some pink edge painting and a lovely pink-lined envelope. 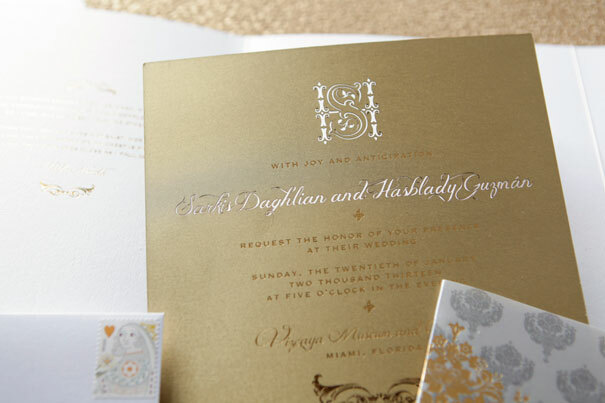 The party invitation featured multiple letterpress runs, pink edge painting and a rhinestone. This entry was posted in invitations, Uncategorized on August 15, 2014 by Ben Upham. Molly, We Think You’re Amazing, Too! Been a little while since we last blogged…blame it on wedding season CHAOS!! Anyway, our good friend and client Molly Sims has given us some love on her blog, MollySims.com and on LA Racked! Lots of good press for us (no pun intended). Molly is at the studio often and we’ve gotten to know and love her and her laid-back, down-to-earth style. We’ve worked with Molly on several projects. 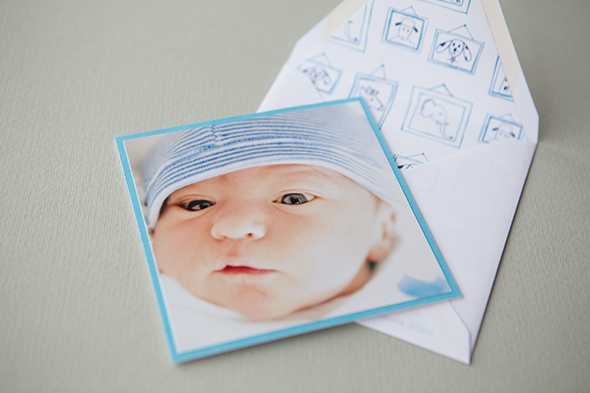 For the blog post, she choose to feature this adorable birth announcement we did for her son Brooks. This entry was posted in birth announcement and tagged Molly Sims on June 13, 2014 by Ben Upham.